What comes to mind when you think of ‘return on investment’ (ROI)? For most of us, our mind probably jumps to calculations of costs and revenues. The end goal, no matter the project, is for the last cell in the spreadsheet to be black or green, not red. I want to encourage you to expand your thinking about ROI. Measuring the ROI for pursuing a goal needs to extend beyond financial metrics. Look at the capabilities you’ve created, the reputation you developed, the insight you’ve gained, and the relationships you’ve nurtured to get the complete picture. Getting a positive ROI on these non-financial metrics has a lot to do with your personality type. Knowing which dimensions of ROI are most productive for you to pursue has to do with your unique strengths and challenges for growing each of your four non-financial sources of capital. Before we move on to maximising ROI using the strengths of your personality type, let’s review the five sources of capital. These are: our financial capital (money you really have – not credit cards! ), social capital, knowledge capital, brand capital, and infrastructure capital. Since we’ve all heard plenty about ROI based on financial capital, in this article we’re going to focus on the four sources of non-financial capital. 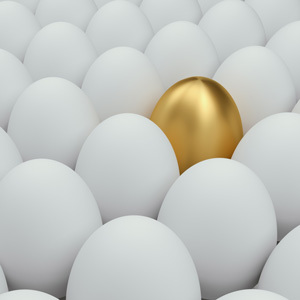 Depending on your personality type, you will have unique strengths and challenges for using each of these four sources of capital. Knowing how you can best leverage your strengths and balance out your challenges with each of these sources of capital can help you much more quickly pursue the goals that are right for you. When you can achieve the goals that are important to you with less effort, in less time, and achieve better results, then you have increased your return on investing the most important asset you have: your time. 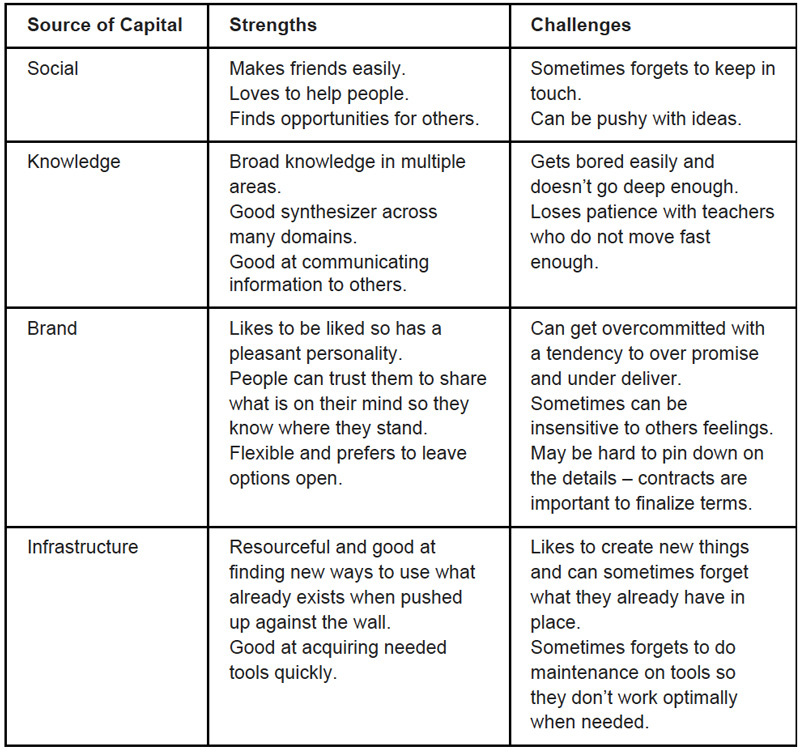 Below is an example showing my personality type’s strengths (I’m an ENTP) for each of the four types of capital. So what does all this tell me about increasing the ROI on my projects? Let’s go through an example: one goal I currently have is to sail the Northwest inside passage in six months to a year from today. Which sources of capital will my pursuit of this goal help me develop? Social capital? Not so much, since this a goal I want to pursue on my own. Knowledge capital? Definitely: this goal both builds on my current sailing knowledge and will help me develop my skills in new areas. I’ll get a great knowledge ROI from this project. Brand capital? Possibly: I’ll gain bragging rights and will be able to make new connections with other people who sail based on this experience. Infrastructure capital? Yes, as pursuing this goal will require me to invest in supplies I’ll need to complete the trip, so I’ll be prepared to take other sailing trips in the future. Choosing goals and projects based on the strengths of your personality type will help you get the greatest ROI in terms of social, knowledge, brand, infrastructure, and financial capital.